Christians are good at telling stories but rubbish with numbers. This was one of the key observations at last night’s Cinnamon Faith Action Audit Report launch which presented the biggest ever survey measuring the extent of church social action work in this country. During the event Ruth Gledhill, the Times Religion Correspondent from 1987 until last year, spoke of journalists’ love for numbers and statistics which so easily can be used to fuel controversy and create headlines. Throughout her time at the paper, the numbers that would most frequently appear in relation to the Church were the latest attendance figures, which year on year would present further decline and give the impression that the Church in the UK was gradually crawling closer to the edge of the cliff of extinction. Consequently, when the churches made it into the papers, it was usually centred on death and the loss of social significance. Cynicism, as Gledhill explained, was a natural attitude towards the Church. She said that one solution to the cycle of negativity is the sort of news that this report from Cinnamon Network brings. The organisation’s purpose is to serve the nation by making it as easy as possible for local churches to help those most in need in their communities. This is done through advice and the distribution of government-funded micro-grants to churches. These start-up funds, usually in the region of £2,000, are used to help set up social action projects based on a franchise model. 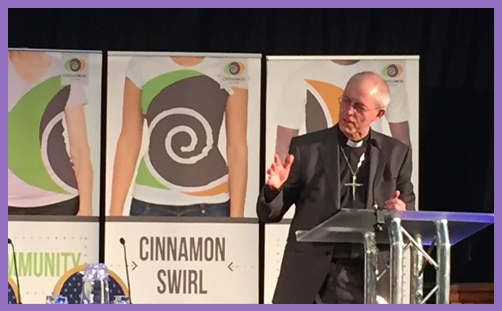 Cinnamon Network has a current portfolio of 25 different projects which have been founded by different churches and organisations, and have proven to be successfully adaptable in different local communities. These include the well-established Trussell Trust foodbanks, Street Pastors and debt counselling by Christians Against Poverty, along with many others including mentoring for young people, the unemployed and ex-offenders leaving prison. 3,500 churches now lead one of these projects with 500 having been added in the last year. The success rate is high, too, with 97 per cent continuing beyond their first year. Now in only its fifth year of existence, Cinnamon Network has sought to undertake an audit to begin to establish the extent of the work of the 60,000 churches and other faith groups across the whole of the UK and the impact they are having. Assessing church social action is a near impossible job, but at the start of this year a sizable body of evidence was collected. 4,440 churches were invited to take part of which 2,110 responded; and more detailed audits were carried out across 57 cities, towns, and villages in both urban and rural areas looking at the work of all faith groups. This sample size is far in excess of the average opinion polls during the run-up to this month’s General Election, and the findings deserve to be treated with a good deal of respect and credibility. These are the type of statistics that Ruth Gledhill was desperately wanting to use to make headlines. The survey reveals that the time alone given exclusively by those audited churches and other faith groups through social action projects is worth over £200 million a year. The report also calculates that if 47.5 per cent (the same percentage that completed the survey) of the 60,000+ faith groups in the UK delivered what the Cinnamon Faith Action Audits’ responding groups do, this would mean that, collectively, the faith sector annually delivers an incredible 220,000 social action projects, by approximately 125,000 paid staff and 1,910,500 volunteers supporting 47 million beneficiaries. Even if some beneficiaries are in receipt of more than one service, as was acknowledged at the report launch, these are still incredible numbers. The value of this work is over £3 billion a year. And this amount only includes volunteer and staff time. If knock-on benefits to communities and use of buildings and other physical resources are taken into account, the figure would be pushed considerably higher. The point of producing these figures is not to boast, but to reveal the extent to which the Church is fulfilling its calling to serve everyone it comes into contact with. No longer can government, local authorities, secularist groups or anyone else claim that the Church or the Christian faith is irrelevant in this day and age. Since 2008, society’s idols of materialism and wealth have been toppled by the recession, but the eternal values found at the cross have not, the Archbishop affirmed. The Church is now filling the gaps that have opened up and will continue to do so as long as there are people who need loving and their dignity preserving. ++Justin went on to say that according to a YouGov poll in 2013, 41 per cent of 18-24 year olds believed that religion is more often the cause of evil in the world, compared to 14 per cent who believed it was a cause for good. This report laid the truth bare, proving that Christianity is not mere ‘do goodery’ but far deeper. Jesus was given the title ‘Emmanuel’, which means ‘God with us’. God is not distant, but knows us by name. When someone remembers our name rather than treating us as a number to be processed, our dignity is restored. Faith is a driver that, through the life, death and sacrifice of Jesus, along with the hope of His resurrection, gives us strength to lay our lives down for others. Such self-sacrifice is the antithesis of what our self-obsessed society encourages us to do. The Christian faith compels us to make the commitment to be with other people in their place of need, as Jesus sets out in the parable of the sheep and the goats. There is no doubt in Justin Welby’s mind that the hope which the churches are demonstrating through their work is a gracious move of God. This report is bringing the good news that God’s power is alive in His Church, and that faith motivated by His love is undeniably a force for good in our society. These numbers deserve to be acknowledged and make the headlines, but it is the faith behind them that truly has the greatest power to change lives.